An excellent, imposing five bedroom stylish villa, within beautiful landscaped gardens on a hillside with lovely sunset views to Nathon Ferry Port, and the National Marine Park. A very private hillside retreat named Maleesalan. With spectacular 180 degree mountain, sea and island views and a cooling sea breeze most of the year this is an ideal family holiday location, sleeping up to 10 people in five bedrooms, or alternatively the villa can be rented with four bedrooms only. 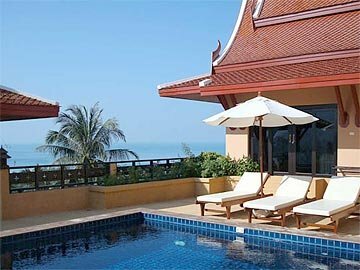 This Villa offers a very high standard of accommodation, all bedrooms have King size beds and ensuite facilities. The ground floor family bathroom has a large wet room shower, a sink and a WC. There is a spacious lounge/dining room that comfortably seats 10, with 2 designer sofa's and 2 armchairs, coffee table, 50" TV and CD/DVD player. In the master bedroom and the kitchen there is satellite TV, and in the 4 other bedrooms each has a TV and a DVD player. There are hair dryers in each of the bathrooms, we use two pin circular adapter. The lounge has a patio door which leads out on to a large balcony and down to the lower level where the swimming pool and 4 guest bedrooms are located. Also situated on this level is the 'sala' terrace from where there are 270 degree views of the surrounding country side and sea. From the multiple terraces and alfresco dining areas you have wonderful panoramic views of the surrounding areas. Wifi is also available throughout, plus satellite TV flat screen tv's. Please note that as our commitment to the Green Samui initiative, electricity use will be charged as per meter.